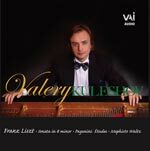 The distinguished pianist in a dazzling recital, recorded live in 2005. The New York Times has hailed Kuleshov as a pianist who has everything: the fingers to negotiate the virtuoso repertory, the musicality and imagination to make the most familiar music sound fresh and compelling. Program features works of Franz Liszt: The Sonata in B minor, the Grandes Études de Paganini, and the Mephisto Waltz No. 1. Digital Stereo.